Check out this great clip of Bob Morgan talking about his house move from Ashford to Southampton. Thanks for doing the video for us Bob. We received some great feedback on our house removals service over the Christmas period. We always try and deliver a house move that exceeds expectations so it is always great to hear that our customers think so to. Whatever type of house removal you need you can be sure of a great service from Colin Batt Removals; just read the feedback. One man, Wilfred arrived in a van on Thursday and quietly packed the contents, finishing at 1.30pm. On Friday Steve and his partner packed everything quickly including many pots of plants. They worked hard & efficiently, and were finished about 11.15am. I was impressed with the care taken in the packing and emptying the contents in my new home quickly but carefully, finishing quite early in the afternoon. I am glad I chose Colin Batt Removals. I can’t praise Colin Batt’s staff highly enough. The xxxx men arrived promptly at 8 a.m. on our moving day, they introduced themselves and were all smartly dressed in the firm’s t-shirts and trousers, and each one of them was extremely polite. Amazingly, all our possessions were carefully loaded and then equally carefully unloaded and then equally carefully unloaded at the new house by approx 4 p.m. The boys were good humoured, polite, very careful with our property and I would recommend them unreservedly. The move went very smoothly and the guys were polite & helpful – thank you. The team from Colin Batt Removals moved us very recently to our new home and they were absolutely amazing. Everything went like clockwork from start to finish and this was a massive help during a quite stressful time. The boys were wonderful, taking much care of our furniture and belongings. We would honestly employ them again should we need to and we can highly recommend this professional, caring and just brilliant removal company. To guarantee we have the skills and experience to deliver on any type of removal, we conduct regular removals training covering every aspect of the job. You may need a piano moving, your china and glass packing, fine art or antiques storage, export and shipping or just a normal house move within the UK. Whatever you need we are dedicated and committed to be the best removal company in the UK. We feel this is why we get such great feedback from all of the house moves we do. Happy New Year to everyone from Colin Batt Removals, may 2017 bring you health, wealth and happiness. We are really pleased to say we have had some fantastic house removal reviews from our customers from Kent in February 2016. A big thank you to all the customers who took the time to give us this feedback. We really appreciate the feedback and overall 99% of our customers would recommend our house removal and piano moving services to their family and friends. It is always great to receive positive comments but we want to hear all comments, good or bad. This is why all of our reviews are collated and verified by an independent company, Reference Line. This allows us to continuously challenge ourselves to improve our removals service. You can read all of our house removal reviews by following the link in the footer or clicking here – House Removal Reviews. Great service from the office staff and the team of guys who worked really hard on the day. The team were very courteous, helpful and flexible. they were very professional with removal of all items from the house. The move ‘in’ went equally well and flexibility and meeting our requirements was a key point of the success. Very helpful. Dismantled big furniture pieces and reassembled where needed. Guys were courteous and listened to my needs and wants. Thank you! Choosing a house mover is a tough job. Independent reviews help you to gain a true picture of a company’s performance. Always ask for references or search online for any removals ratings or reviews. 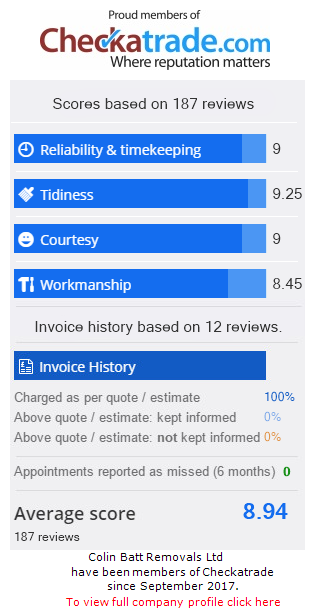 Any reputable removal company, such as members of the British Association of Removers, will have a customer feedback procedure in place and will be able to show you their customers’ comments. Use these to help down-select the removal companies you like and then get a minimum of 3 quotes from different companies for your move. Happy New Year from all of us at Colin Batt Removals Firm and we hope you had a great Christmas. While you were enjoying some well earned time off you may have sat down with the Kentish Express on Christmas Eve and seen a great article on us. We’re very excited that the Kentish Express journalists wanted to write a piece on us and found our removals firm story interesting. We’re really proud of our history and our reputation. We have worked hard to grow and nurture this from the very first day that Colin Batt started the Company back in 1978. We have grown a lot since those early days but the Removals Firm is still family owned by Simon Batt and now covers house removals, piano moves, storage and document archive. In fact, we have a new and expanded store on Maidstone Road in Ashford, Kent. If you missed the article or didn’t get a copy of the Kentish Express here is a copy of the great editorial. An RAF Typhoon fighter pilot turned businessman says business is booming after his removals firm completed the purchase of new premises. Simon Batt, 39, took over Colin Batt Removals from his father just over three years ago alongside childhood friend Andrew Urquhart. As a Royal Air Force pilot and father of one he is keeping alive the family business that his father started in Challock in 1978. The company originally prided itself on being one of the best at moving musical instruments such as pianos and has even carried out work for the Royal Household and moved Beethoven’s piano across Europe. But now Mr Batt says things are really moving after he took over the Move-It Storage Warehouse in Maidstone Road off the A20. He said: “We have pretty much doubled our workforce and completed our move to the new location. So we’re really pleased with the progress, especially given the growth of the business even when the economy has been fairly stagnant. “My father started the business, but my passion while I was growing up was always for flying. I met Andrew in the RAF Air Cadets as youngsters and we’ve been friends ever since. “We thought it would be a good idea to work together here with him managing the business day to day while I finish my career in the RAF. “We’re very lucky that my father built such a great company with a great reputation. He started it as a piano-moving business on his own with a van. He said the business grew such a big reputation that musical performers like Duran Duran and Elton John also used the company’s services. But the greatest honour was perhaps moving Beethoven’s famous piano from a museum in Hungary to tour Europe. Mr Batt said: “It is insured for about £7 million, but it is 175 years old so it is really priceless. His friend Andrew had left the Air Training Corps to pursue a golfing career.